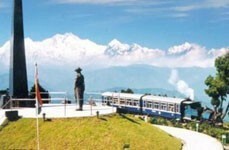 Our car driver will be there to receive you at New Jalpaiguri Railway Station (NJP) or Bagdogra Airport ( IXB ) – You will be assisting for the transfer – Transfer to Gangtok – Nearly 120 Kilometers 4 hours drive – Gangtok – The capital of the 22nd State of India, Sikkim is one of the most beautiful hill station with varied options for tourist – It is known for the monastery, Orchids, High altitude Lake and butterflies – It has option for tourist of all ages – Check into Hotel –Evening free to roam around M G Road (Mall) or local Shopping center – Overnight stay at Gangtok. Morning breakfast at hotel – Excursion to Tsomgo Lake & Baba Mandir nearly 40 kms and 2 hours drive -Tsomgo Lake is situated at an elevation of 3753 m / 12310 ft – The Lake is oval shaped lake nearly 50 ft deep – Generally covered in snow for most of the year the year –home to the Brahmini ducks & many migratory birds – Nearby is the sacred Baba Mandir known to be a very holy site for all – Back to Gangtok. After breakfast drive towards Yumthang situated at an elevation of nearly 11800 feet – On the way you may visit the famous hot spring which is known for its curative properties of skin diseases – Yumthang is a valley near the river Lachung Chu surrounded by mountains – In spring the valley erupts in riots of colors as Primulae, Rhododendrons and many other Alpine flowers in full bloom along with snow covered valley except in autumn – During winter Yumthang is somber with snow all around and the snow clad mountains adding to the ethereal beauty. (Optional visit to Zero Point at extra charge). 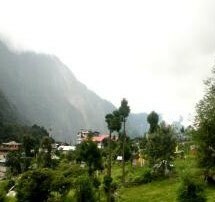 Return to Hotel for Lunch – Transfer to Gangtok via Twin Waterfalls, Bhim Nala Waterfalls –Night stay at Gangtok. Morning breakfast at hotel – Drive for visit to Enchey Monastery, Barthang waterfalls, Nam Nang view point, Ropeway, Flower Show, Directorate of Handicrafts & Handloom, Research Institute of Tibetology & Do Drul Chorten (Stupa).etc – early morning City tour of Gangtok –– Back to hotel – Transfer to Darjeeling – Nearly 110 kilometers 4 hours drive – At an height of 2123 meters / 70001 feet lies the land of breathtaking beauty, sloping tea gardens with spectacular views of the Mount Everest is the Queen of the hills – It is also home to the famous World Heritage train – The Darjeeling Himalayan Railway (DHR) – Drop at hotel- Overnight stay at Darjeeling. Early morning at around 3:45 AM drive to 8000 feet / 2440 meters through primitive forests of oak, magnolia to Tiger Hill to view sunrise over Kanchenjunga Peak (subject to clear weather) – On the way back visit Ghoom Monastery, Peace memorial & Batasia Loop – Back to hotel – After breakfast half day city tour includes Padmaja Naidu Zoological Park, Himalayan Mountaineering Institute (Closed on Thursday), Ropeway, Tensing Gumpo Rock, Tibetan Refugee Self Help Center (Closed on Sunday), Tea Estate, Natural History Museum (Sunday Closed) etc – Back to hotel – Overnight stay at Darjeeling. Morning breakfast at hotel – Transfer to New Jalpaiguri Railway Station (NJP) or Bagdogra Airport (IXB) – Nearly 80 kilometers 3 hours drive – Guest are advised to start early and not to rush – Forwarding Journey.